Shatter Me elicits extreme feelings in my fellow reviewers. Some absolutely loved it, and others are disgusted by it. I personally take a more average position; I enjoyed Shatter Me, though it wasn’t my favourite. We meet Julliette in a prison-like environment, where she hasn’t talked to anyone or touched anyone for months. On one day, a boy is placed in her cell, and everything changes. It’s probably the writing style that divides most readers. The writing is utterly crazy. Every sentence is filled with metaphors and similes and strange groupings of wrods that truly don’t make any logic sense. I’s written from Julliette’s perspective, and there will often be sentences like “My jaw drops on the floor and my face beams like a light in the dark sky” (truly, I made that up, but I’m sure it could have been in the book). The narrative is full of crossed-out words and other quirkiness that doesn’t make the reading experience any easier. Reading Shatter Me was tiring. After a while I started reading faster, so I could just get past all the metaphors and just get on with the story. The story was fun. You know, there isn’t much to work with – the planet is screwed since we polluted her too much, and it seems as if some weird military guys are in power now. They control the food supply, and want the ordinary peoples to behave like sheep. Of course Julliette tries to get out of the clutches of the military dudes and is well on her way to save the world. It’s not a very new story, it’s basically standard dystopian meets crazy superpower girl, but I liked reading it nevertheless. The ending packed a twist that really makes me wonder about what direction this series will take. Don’t trust the weird cover with the white dress. That one has absolutely NOTHING to do with the story. 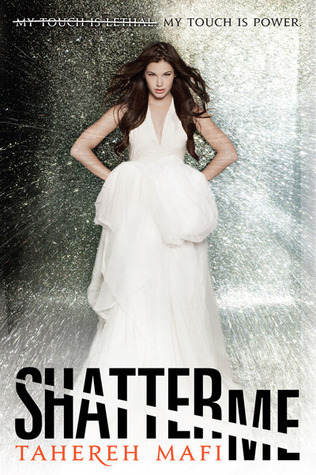 Read a teaser before you buy Shatter Me – crazy writing is crazy.